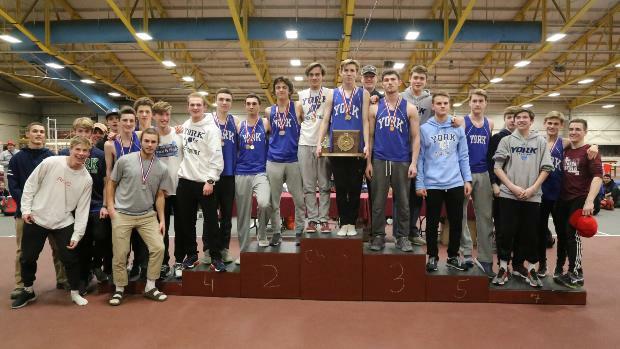 The York boys entered the Class B indoor track & field championship as one of the teams that were in the mix to win the state title. The Wildcats were seeded third in the virtual meet with 48.25 points. At the end of Saturday York easily surpassed their seeded total as they tallied 77.50 to turn back a strong effort by runner-up Hermon by 20.5 points. The 4x800 set the tone as the Wildcats moved up one spot in the seeds with their runner-up finish in the event as they improved by four seconds on their seasonal best. Senior Jon Burke provided a spark in the hurdles as he upset top seed Zach Beaton in a lifetime best 7.88 in the final. In the 400m senior Nick Rainforth the second seed easily surpassed his best time of the year as he dominated the fastest section en route to a personal best 53.01 victory. The surprise was senior Trevor Lavigne's second place finish in 54.83, he wasn't seeded to score. Rainforth moved from the seventh seed up to third in the 200m as he won his section in 23.95. "Wearing spikes definitely helped." Rainforth said post race. All Western Maine Conference runners had to compete all season without the aid of spikes as they compete at USM which doesn't allow high school athletes to wear them in meets. Jon Rodrigues took advantage of his opportunities in the triple jump as the senior extended his personal best throughout the competition as he leaped a best of 42-3 1/2 on his final jump which tied him with Waterville's Ethan Nurick for the top jump in the competition but Rodrigues was the winner based off his second best jump of 42-2 3/4 which he achieved on his fifth attempt. Belfast junior Jack Hansen won a pair of individual title with wins in the pole vault (13-0) & long jump (21-8 1/2). The long jump mark was a personal best. Hansen after winning the vault raised the bar to 14-1 in an attempt to set a new meet record but he would come up short. He also was third in the 55m hurdles. Sam Russ of Lincoln Academy won the mile in 4:35.80, while Bucksport senior Carter Tolmasoff was the speediest with his 6.71 in the 55m dash.